The Wrap, Newser and Content Aggregation: How Much Attribution is Enough? The cease and desist letter and the ensuing war of words between The Wrap’s Sharon Waxman and Newser’s Michael Wolff is getting a lot of industry attention this week. To me the real question is: when one site aggregates another’s content, how much attribution is enough? The value and legitimacy of content aggregation is a topic for another post; I think most would agree that curation serves a more useful purpose than aggregation. But for better or worse content aggregation is a big part of online news dissemination today and I wouldn’t expect it go away any time soon. With that in mind, it is important that aggregators adhere to some basic rules of conduct: a) create their own summary text, don’t just “borrow” from the original and b) properly credit original sources through attribution links. 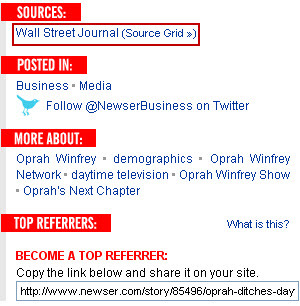 To see what type of attribution Newser is providing, I picked a random article from the sources grid on their home page today: Oprah Ditches Daytime for New Evening Show. Two links is good attribution; I think that qualifies as giving proper credit to the original source. But as pointed out by The Wrap, Newser does not always do this. In looking at a selection of other articles in some cases only the “Sources” sidebar link is provided; The Wrap has also claimed that sometimes no attribution link was provided at all. Personally I think aggregated stories should always include an inline attribution link. A sidebar link may not get proper attention from either users or search engines so a link should be placed within the actual editorial content. 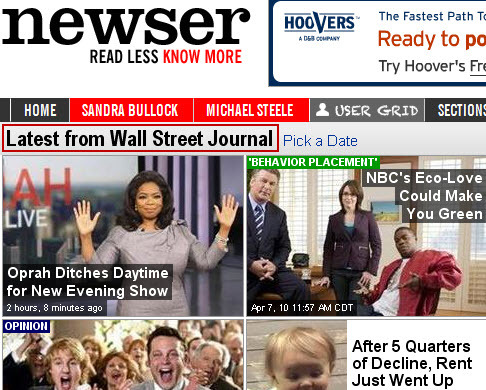 I’m the Marketing Manager at Newser. Thanks for the write up. I wanted to point out that Waxman is absolutely wrong when she says we sometimes don’t credit our sources at all. It’s actually technically impossible to omit the link on the right under SOURCES based on how our system is set up. It’s always there. Thanks for your comment Brittnay. In spot checking articles I didn’t come across any that didn’t have at least the one attribution link in the sidebar. I’m a proponent of inline attribution myself, but I think including the source in the sidebar too is a good thing. Yep, you’re right. And 99% of the time, we include those (when we don’t, it’s a mistake). I wonder why people still believe in such a slow process that a C&D entails. Why not just send a DMCA complaint to the web host and get the site taken down? Or … well, ask nicely. Having represented several “big” news sources in the blog space, I can tell you that in my several years of doing this, the requests I have made have never been denied, even overseas. Eventually, justice prevails. It would prevail a lot quicker if you make the request before making any type of [legal or otherwise] threat, though. Thanks for the input Tamar. A lot of the publishers we work with are constantly getting their content scraped; it’s a real problem. I haven’t been personally involved in helping to combat it, but in situations like that a DMCA complaint seems like the way to go.